I was looking for a night stand that would coordinate with the one I already have. This does the trick quite nicely! It is of decent quality and I would definitely recommend this chest to a friend! Blending of European influences makes Magnolia Manor a truly unique style for any living space. Warm antique finishes and artistic distressing along with grand scale, this is a group to be passed to generations. I love the Magnolia Manor Antique White furniture. I previously bought and office set and I wanted something to put our printer on. I bought this piece to hold our printer and also give us drawer space for office supplies. This piece was less expensive than the two drawer file cabinet so I opted to purchase this piece to match our office set. Great quality and it looks beautiful in our office. Fast shipping. I would definitely buy this again. We bought the entire set of this Magnolia Manor bedroom furniture. It is very high quality and sturdy. The nightstand was delivered in a very sturdy box with strong/thick cardboard corner inserts to prevent any damage during shipping, it arrived in perfect shape. The distressing on this set is gorgeous goes perfect with my new farmhouse theme. I would highly recommend this furniture set the quality is worth every penny. 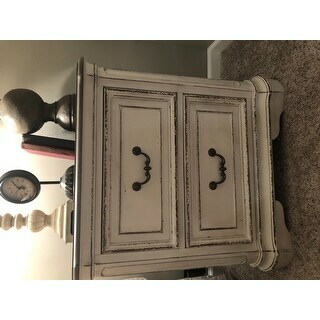 Absolutely stunning piece that I purchased to complement the Magnolia Manor Antique White Dresser, both of which have garnered endless admiration from others. These are truly treasured pieces that will be passed down through the generations. Couldn't be happier with my purchase! Great quality! I was so close to giving the nightstands 5 stars but there’s a slight stick to 2 of the drawers. Not a huge deal, I’m sure it will smooth out with use. Also a random spot of red paint on one nightstand was odd. Beyond that, I could not ask for a better set of nightstands. The colors are exactly as pictured and the finish is high quality. Lots of great storage for a not-too-big nightstand. I plan to buy more pieces of furniture from this collection. Love this nightstand. It matches my set and is just the right size. Also, has the option of storing jewelry in the top drawer. Well packaged upon delivery. Met expectations! Pleased with item. It arrived very quickly and looks nice inside and out. Matches the armour perfectly. This nightstand is the perfect size and color for what I wanted it for. It's very heavy and well-made. 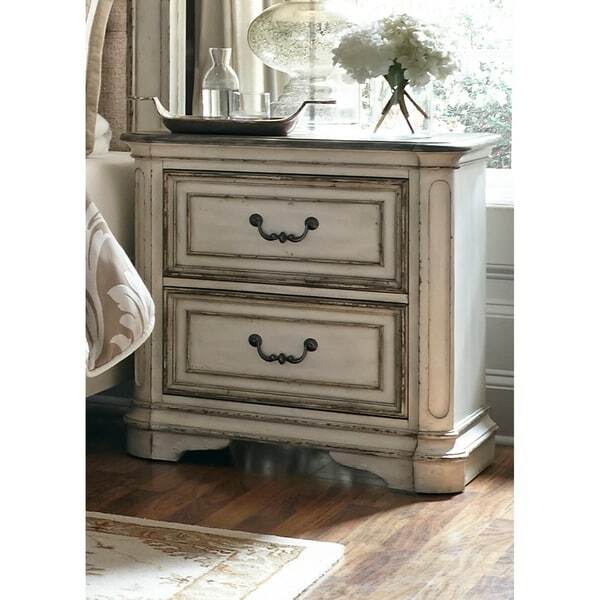 The drawers glide super easily and this piece looks like it's more than it cost. The drawers stick a bit so when you try and open it it wants to tip forward but good value for what we paid. Nice deep lined drawers though! I love the size of this. It is not dainty or small so it sits well with my king size bed. Good quality and craftsmanship. The drawers are nice and big. Purchased this bedroom set somewhere else and needed another nightstand. This one arrived very quickly, was in excellent condition and the cost was very reasonable. Customer service during my order was amazing! I love the look of this nightstand in my master bedroom! Great quality with what appears to be cedar lining. Nightstand is really nice. Good quality - especially for the price. I ordered the nightstand before I purchased the rest of the bedroom. Once I saw the nightstand, I ordered the complete bedroom. Love, love, love these tables! Oustanding quality!! I purchased two night stands, and they dress up my bedroom beautifully. I highly recommend!! Great quality! Exactly what I wanted. Has the rustic but also modern look. The top is a barn door gray brown. It completes my set and looks wonderful at a wonderful price! Appears to be stable and well made.